Connection with other women lawyers. Training and support for judicial and leadership positions. 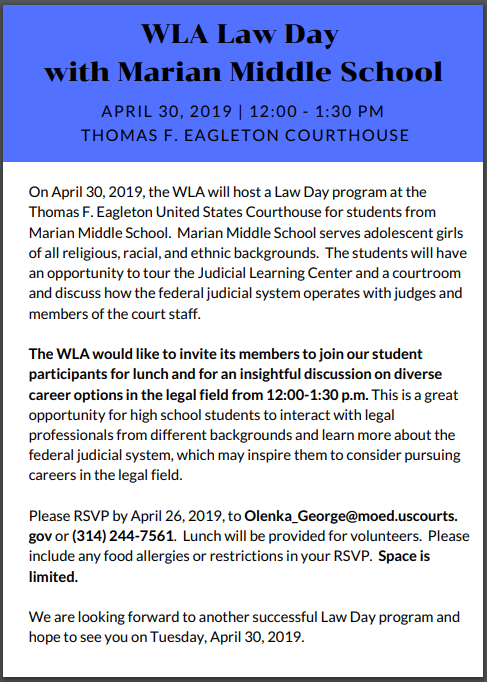 Information about WLA events, activities, and projects. Opportunities for volunteerism and advocacy relating to women in law and society. Networking, marketing, career support, mentorship and leadership opportunities. WLA's bylaws provide that full membership is open to any person admitted to any state bar. Associate membership (i.e. full voting rights but not eligible for office) is available to individuals who have graduated from or are enrolled in a school of law or a graduate school of law but who are not licensed to practice law. Each member is entitled to one vote on each matter submitted to a vote of the members. Amoung other issues, members vote to elect the Board of Directors. Supporting and promoting women laywers and law students in professional endeavors. Addressing gender bias in the legal profession. Endorsing individuals for judicial selection and appointment. Supporting individuals in non-political positions of influence, including judicial commissions and bar leadership. Sponsoring educational and social networking events. Providing scholarships to female law students. Raising financial support and awareness for local charities benefitting women and children. Tracking State legislation impacting women and children.